Looking for tried and true, simple dinner ideas? 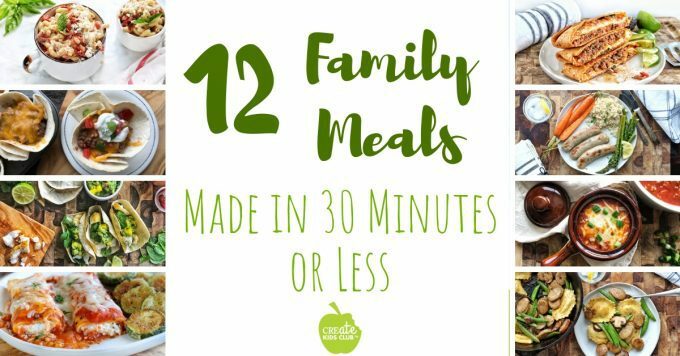 All 12 recipes utilize fresh, frozen, or canned vegetables helping you get a healthy family meal on the table in 30 minutes or less. It’s just the beginning of the school year and already I’ve had multiple conversations on the topic of not knowing what to make for dinner. You get home from work then drive kids to sporting practices or games. Once you get home, everyone is hungry and you still have figure out what’s for dinner. My favorite strategy is utilizing a slow cooker for busy nights, but you might not like the idea of getting a meal ready the night before or in the early hours of the morning. You might be looking for ideas to make quickly once you get home, like those friends I was talking to. 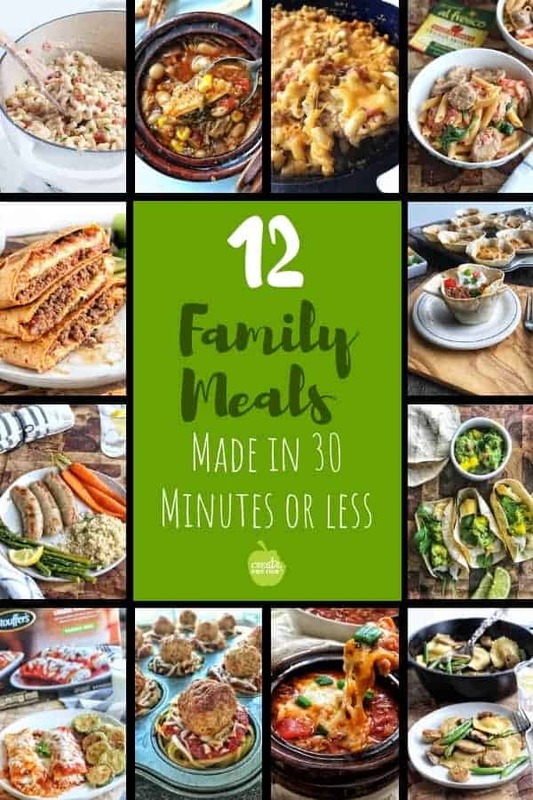 These 12 simple dinner ideas are healthy family meals perfect for busy nights. They are some of my favorite 30-minute meal ideas for kids. The best part of these simple dinner ideas is that they make for a balanced meal in and of themselves. Each recipe utilizes fresh, frozen, or canned vegetables. Fresh can always be swapped out for frozen or canned when needed. Pro Tip: Canned vegetables are grown less than 12 miles from processing plants, are picked at peak ripeness, and go from the farm field to the can in 8 hours! No need to feel guilty about utilizing produce that helps cut back on waste. 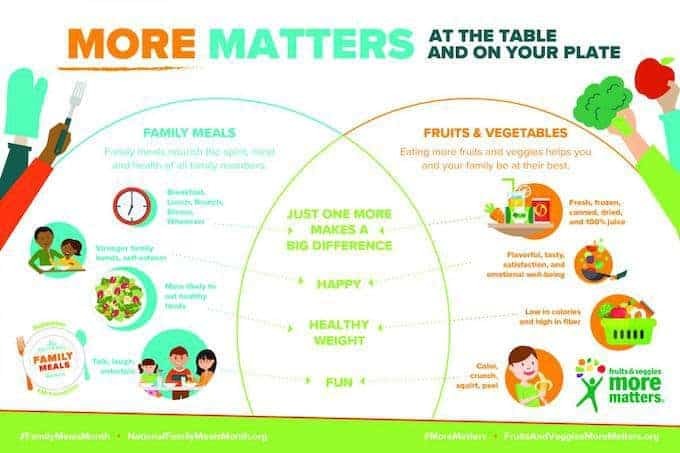 In the end, the only thing that really matters is that your family eats more fruits and veggies – so go ahead and use those easy options and feel good about it. There are common ingredients you’ll find among these recipes. Keep these staples on hand and you’ll always be able to throw a 30-minute meal together! When you feel like hitting the drive-thru, try this homemade Crunch Wrap Supreme instead! It might look complicated to make, but it’s not. Watch the recipe video to see step by step how to easy it is to make this delicious Mexican recipe. It’s packed with canned tomatoes and fresh spinach – don’t worry, your family will be asking for more! This creamy pasta dish utilizes pre-cooked chicken sausages and canned tomatoes – packing flavor and nutrition into this delicious dinner. Who can say no to a pasta?! Learn to Balance Your Plate utilizing frozen entrees, pairing them with a nutritious side dish. This cheese manicotti and zucchini crisps dinner is served in under 30 minutes! Traditional spaghetti and meatballs get a fun makeover with this yummy meal idea for kids. Freeze these cups for another meal or use in your childs lunchbox the next day! No need to serve only beef tacos. These simple fish tacos can be customized to each family members preferences, and come in under 30 minutes! I can’t get my kids to eat traditional stuffed peppers to save my life, but turn this dish into a soup and they ask for another bowl. Packed with veggies, sausage, and rice this is a balanced meal served in a steamy bowl. Tacos are turned into a fun handheld meal – and made more nutritious with a few “extras” added to the meat. My non-bean eating son gobbles these down every time they are served. Mac and cheese is certainly a kid favorite. This version includes a hidden veggie that my kids still don’t know is in there. This pasta dish is so flavorful, your family will be asking for more! This versatile recipe can be made with any in-season veggies. Grab your favorite flavor of pre-cooked chicken sausage and make your families favorite combination! Packed with canned veggies, beans, and rotisserie chicken this chicken tortilla soup is bursting with flavor. It can be made on the stove top in under 30 minutes or let cook all day in your crockpot. Grab pre-cooked chicken sausage links and a box of ravioli and your halfway done with this delicious dinner. Flavored with a touch of butter and lemon juice, this recipe needs to show up often on the dinner table. Don’t have fresh veggies? Try frozen! If you enjoyed these recipes, please leave a star rating on your favorite or comment below! Then join me on social media @CreateKidsClub and share photos of your finished product!